For other uses, see Lifebuoy (disambiguation). Lifebuoy is a brand of soap marketed by Unilever. 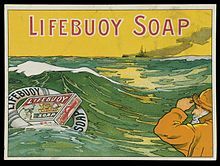 Lifebuoy was originally, and for much of its history, a carbolic soap containing phenol (carbolic acid, a compound extracted from coal tar). The soaps manufactured today under the Lifebuoy brand do not contain phenol. Currently there are many variants of Lifebuoy. 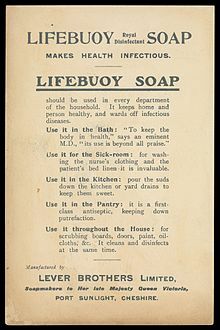 Advertising material for Lifebuoy Soap listing the products many uses. Includes the tag line "Makes Health Infectious." The list includes the use of the product in the bath, with an endorsement by an "eminent M.D. ", around the house as a general purpose cleaner, and in the kitchen as a drain cleaner. 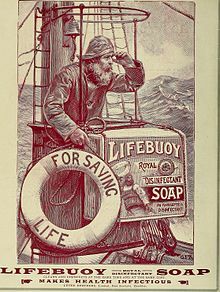 Lifebuoy was introduced by Lever Brothers in 1895 in England. Originally a carbolic soap containing phenol, different varieties were later introduced without the medicinal carbolic smell, such as the coral-colored Lifebuoy during the late 1950s and Lifebuoy Minty Refresher in 1966. 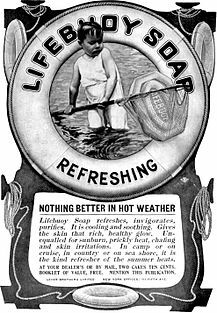 Lifebuoy was one of the most popular soaps in the United States from approximately 1923 to the mid-‘50s, when perfumed soaps took over the market. It was the best selling medicated/health soap in North America until roughly 1951. It was well known for its red and yellow packaging, red color and octagonal shape, as well as its carbolic aroma. Sometime in 1951 or 1952, due to declining sales, Lever Bros. experimented with adding perfumes to the soap, and made the changes permanent in 1954. Earlier experiments in 1936, 1938, 1939 and 1940 also added an artificial scent to the soap, but generally lasted only one batch. Sales, however, continued to decline until 2006, when Lifebuoy was officially completely pulled from the American market. Lifebuoy's popularity reached its peak between 1932 and 1948. After World War Two, when more materials were available and rationing was over, other more appealing soaps began to take hold of the market. Its popularity waned steadily through the 1950s. In the mid/late 1960s it saw a popularity surge which would last through 1973. This was, in part, caused by the introduction and success of Lifebuoy White in the American market. After this decline, the Lifebuoy brand was seen less and less in the American market. It was pulled from American shelves starting in 2003 and was completely phased out of the American market by 2006. Sometime in 2008 or 2009, Unilever released Lifebuoy Classic, a modern soap with retro packaging and a medicated scent intended to be similar to that of the 1950s product. It saw novelty success but was never embraced as a staple product in the American home. It is now primarily manufactured as a gift intended to be reminiscent of A Christmas Story and is currently sold in the official A Christmas Story website gift shop. Although Lifebuoy is no longer produced in the US and UK, it is still being mass-produced by Unilever in Cyprus for the UK, EU, US and Brazil markets, in Trinidad and Tobago for the Caribbean market, and in India for the Asia market. Unilever in Cyprus and Trinidad and Tobago is manufacturing the Red Lifebuoy Soap with a carbolic fragrance, but as of 1976 it no longer contains phenol. The Lifebuoy soap manufactured in India and Indonesia for other markets including South and South East Asia has been updated to use red and other colours with ‘modern’ aromas. Advert for Lifebuoy Soap from Animal Life and the World of Nature; A magazine of Natural History (1903). When the Philadelphia Phillies played at the Baker Bowl during the 1930s, an outfield wall advertisement for Lifebuoy stated, "The Phillies use Lifebuoy". One night in 1935, a vandal added, "And they still stink". Variations of the joke were also employed by detractors of other losing teams. The term "B.O. ", short for "body odor", is often thought to have been invented by Lifebuoy for an advertising campaign. It was actually coined by a company that made deodorant for women called Odo-Ro-No in 1919, but Lifebuoy made the term famous. The Lifebuoy radio ad, parodied by several Warner Brothers' Looney Tunes cartoons and MGM Cartoons, used a foghorn followed by a "B.O." sound created using a Sonovox. It is the bar-soap used in the 1983 movie A Christmas Story by the main character Ralphie and his family. After his mother washes his mouth out with Lifebuoy for using an obscene word starting with F, Ralphie wishfully dreams that he has been blinded by "soap poisoning" and reduced to begging on the street. When his family sees him, they collapse into melodramatic soap opera-like tears and his father cries out, "I told you not to use Lifebuoy!" In the film, narrator Jean Shepherd noted his disgust toward the soap's taste, even compared to other soap products of the era. ^ "Unilever Lifebuoy brand information". Unilever. Retrieved 2013-03-21. ^ Intimidation Sells Bath Soap, Old-Time.com. Retrieved 2017-07-04. ^ Lifebuoy Health Soap 1948 (audio), another commercial mentioning B.O., Old Time Radio Fans. Retrieved 2017-07-04. ^ "Film: A Christmas Story". TV Tropes. Retrieved 8 October 2012. This page was last edited on 24 March 2019, at 09:53 (UTC).